Heroin and other opioids are ravaging communities across America. Deaths from heroin increased 328% between 2010 and 2015, and drug deaths from fentanyl and other synthetic opioids are now seeing a sharp rise as well. More Americans die from drug overdoses than in car crashes, and this increasing trend is driven by Rx painkillers. The time to take action against this epidemic is now. Opioids – natural or synthetic, illicit or otherwise – act on the body’s opioid receptors and all carry similarly high risks of dependency, addiction and overdose. Heroin is the most commonly known opioid, and as an illicit drug, it poses additional risks beyond simply being a powerful drug. Morphine, too, is well-known for its use in medical contexts. But opioids also include common prescription pain relievers, such as OxyContin, Percocet and Vicodin. If misused or abused, these drugs can cause severe harm. Complicating the landscape even more is fentanyl and other synthetic opioids. These can be used on their own or be unknowingly mixed into heroin or pills. Deaths from fentanyl and other synthetic opioids rose 72% in just one year. What Happens When Someone is Addicted to Opioids? Opioids have a strong risk of addiction, meaning their use or misuse can create brain changes that lead to addiction. A person who is addicted develops an overpowering urge, or craving, for the drug. The person also experiences a loss of control and painful withdrawal symptoms, making it more difficult to refuse the drug, even when use becomes harmful. Most people who are addicted to opioids cannot taper off (use less of the drug over time) without help. What Is The Link Between Prescription Drugs and The Opioid Epidemic? Nearly half of young people who inject heroin start by misusing prescription (Rx) pain medicine which are opioids. Explore this interactive infographic to better understand and get a more complete picture. Why is Fentanyl Even More Dangerous than Heroin? Fentanyl is 50 to 100 times more potent than morphine. Learn more about what to do as a parent to help protect your child from fentanyl. Opioids like heroin and prescription pain pills are ravaging our communities. There are simple steps you can take to help protect your loved ones. 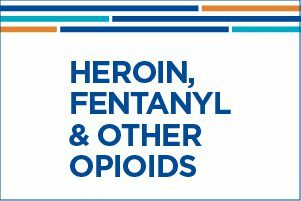 Use our tools and resources to make a plan and begin to effectively address a loved one’s heroin use or misuse of prescription main medicine. We’re dedicated to supporting parents and families in the face of the opioid epidemic, and encourage them to take their learnings back to their communities. Have a concern about your son or daughter struggling with substance use? Get ongoing support and resources tailored to you and your child's needs.